Hey HSB’rs time for another sauce review from California. I just got back from a 10 day trip to Tennessee, Illinois, and Kentucky; so it’s good be home tasting sauces again. I have some catching up to do so you might see a few of my reviews coming up quick. Today I tried LEGENDS, “The Premium Habanero BBQ Sauce”. Initial Impression: When I got the bottle of LEGENDS Habanero BBQ sauce in my hand I sort of had mixed feelings. I was excited about having a habanero BBQ sauce, but the label made me feel that it might not be that great. The grainy, old comic book look and feel of this vast label stretched across the 12.5oz flask bottle made me think of an old paper book cover and the smaller text is hard to read. I most likely would have not picked this up if I had seen it on a shelf. Ingredients: Tomato puree, water, brown sugar, molasses, orange juice, horseradish, worchestershire sauce, habanero peppers and natural spices. No MSG. Well I’m pretty sure they mean Worcestershire sauce, but just in case I left it spelled the way they had it on the label. I’m not sure if it is standard practice to ad MSG to BBQ sauces but I feel relieved to know there is none in this one, whew! Appearance: I really liked the way this sauce looks. It has a reddish brown color with little black flecks; my guess is coarse black pepper, but it could also be the result of roasting the peppers. A few seeds are present. I like the consistency of this sauce; it flow nicely and is still plenty thick. Now I’m getting excited about tasting it! Aroma: Unexpected is the word I would use to describe what I smell when the cap came off. The aroma is very tangy, almost vinegar like. The most dominant scent is definitely tomato. If had had smelled this blindfolded and was asked what it was my guess would have been tomato soup with Worcestershire sauce”¦. Hmm, where’s that grilled cheese sandwich? Taste: I always like to have a taste before trying any sauce on food. Sometimes the incredible complex flavors surprise and amaze you. Not the case here, but sometimes it happens. OK, sweet, spicy, a little tangy. That’s about it. I tasted it a few time and tried to pick up on that something special; but it’s just not there. No particular flavor stood out, nothing surprised me or was distinctly pleasing to the palette. But it does taste fine. The Food Test: It just so happened that on this particular day my smoker has been stocked full of pork shoulder and loin roasts. What better test for a BBQ sauce than this? 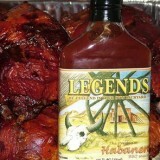 I must say LEGENDS BBQ sauce is better applied to a well seasoned and smoked pork loin than it is out of the bottle. The habanero flavors come to the top and the tomatoey flavors seem to be absorbed by the meat. The heat level is pretty mild for a habanero BBQ sauce; I would say about a 3 out of 10. I would have expected more heat since it is being sold as a Habanero BBQ sauce. Conclusion: LEGENDS, “The Premium Habanero BBQ sauce” is ok in my books. I enjoyed it on my pulled pork and I am at ease knowing that there is no MSG in it! If I were buying a habanero BBQ sauce I would want it to have more heat and really present the habanero as the feature not just a supporting act. If you want a sweet and tangy BBQ sauce with a little bit of heat and a hint of habanero you will definitely like LEGENDS Habanero BBQ sauce. Nice review Ron. That pork is making my mouth drool!!!! Are you not going to D-Day Jodie? I would like too but long drive from Texas really want to try Defcon Wings! Thanks Jodie. After 12hrs in the smoker it just fell apart and begged for sauce! Nice review Ron! Tough to get good BBQ in Toronto in January! (Tough to get good BBQ here regardless) Especially with our first snow storm happening right now! [Comment ID #73611 Quote] I grew up in Ottawa and have been to Toronto many times. I don’t ever remember having BBQ. But I miss our trips to Ontario Place. Well it’s about f*cking time you’re getting some snow. I apologize for my profane outburst, but after surviving the “Storm Of The Century” here in Saskatoon, I’m a little bitter, yes a little bitter and frostbitten. I’m up to my armpits here with snow and it’s cold enough to freeze the Gold Skull off of a Blair’s Holiday Reserve. Good review Ron, check you’re email I replied to yours from the other day. Anybody have a update from Defcon Day. Yeah, wish I was there! I tried the Legends sauce and liked it as well. I am surprised that you didn’t find it very spicy. I thought it was… but that’s all very relative I guess. I like the label, it would look great in a collection. We have a huge longhorn steer skull over our fireplace so maybe Im biased. I like it to Jack. If the maker is going for a western feel with their label, then I think they did a spot on job. Have to jump in off topic folks, the BLANE SET $$$ has cleared, we can all ship on Tuesday, no MLK mail on Monday. Nick has the shipping address. Later, Mrs Aj has ordered me to do stoopid non hot sauce stuff today, lol. This is Matt, V.P. of Legends BBQ. Just wanted to thank you for taking the time to review the sauce. All the feedback is appreciated as it helps us to work toward making the best product we can. You can check out all other Legends products at Legendsbbq.com. Thanks again.